A lonely, foggy island is home to eight families. Twelve-year-old Hal and his friends have always wondered what happened all those years ago on the mainland, that unseen place Out There beyond the fog, and after an astonishing discovery in the woods the children are more determined than ever to find out what their parents are hiding. But their lives are turned upside down when Abigail reveals her closely guarded secret. According to her the children are slowly changing into monsters! Are they freaks of nature or subjects of a sinister experiment? Island of Fog is a story of intrigue and conspiracy. The listener follows Hal Franklin as he struggles to accept that he and his friends are something more than ordinary children and that their parents have been covering up the truth the whole time. With their trust shaken and the unexpected arrival of a strange woman from Out There, the children hide their frightening shapeshifting abilities and pretend nothing is wrong. This was a surprisingly good read. The plot was unique, entertaining and was well written and developed. It centers around a number of families who live on an Island that's surrounded by fog. Each family has a child that is 12 or very close to it, which in itself is very odd! But things are happening to the kids and the adults aren't saying anything. It's not till the curious kids start questioning if the fog is really there to protect them, or to hide things from them, and they "plug" the hole where the fog seems to be coming from, that they get some answers and their lives are changed forever. I loved the world building in this. We find out about the world along with the kids and while it does unfold a little slowly, it still held my attention till the end. The world the kids grow up in is nothing but grey, according to them anyway! It's an island that has no modern items or amenities. It's surrounded by fog and none of the kids have ever seen the sun or sky. They've heard about the world from their parents and what happened. They think that the adults might be lying to them and the world is fine. Plus the things that are happening to them, makes them a lot more curious than normal! The characters were all well written and were easy to like. The changes the kids are going through wee fascinating and I loved trying to see which thing they were turning into. It was an imaginative part of the book and the bit my son loved the most. He had fun figuring things out!! In all, this was a fun, intriguing, if a some what slow burner, read. It held my attention and more importantly, it held my sons attention till the end. He is really looking forward to the next one to see what happens. The narrator took a long while to get used to. He had plenty of tones and voices for the characters, but his voices for the females and some of the kids was really hard to listen to. He had a some what nasally tone for some of them, and had a very "falsetto" tone for other female characters. I found it a slog to get through the audio with him. I think I'll read the next one rather than listen to it! The storyline was very good , but the narrator wasn't very good. His voice seemed to drone on and was very moist. A Different Kind of Island! What was one of the most memorable moments of Island of Fog, Book 1? When the kids got to the top of the lighthouse and saw and felt the sun for the first time in their lives. What about Fred Wolinsky’s performance did you like? How he gives each character their own unique voice and traits. I particularly liked what he did with Miss Simone. Her voice was other-worldly, but believable. This story holds the interest of kids as well as adults. I am looking forward to book 2. Would you listen to Island of Fog, Book 1 again? Why? Definitely! The narrator was clear and colorful with defining each character with a change in his voice! The story kept me wanting more! Which character – as performed by Fred Wolinsky – was your favorite? Of course I loved everyone but you couldn't help but feel what Hal was feeling! The whole story moved me. If I had to pick just one was the proud feeling of accomplishment by everyone's teamwork! Yes, it is a great listen for the whole family, and would be fun to listen to again -- like enjoying a favorite movie again and again. I am sure I will discover some new things the second time around. The book grabs you from the first moment. It is a fun story with intrigue, fantasy, thrills, and adventure. The characters are all well-defined, real, and fun to spend time with. I loved the spirit of all the children -- very positive, lovable, inventive, but still realistic and flawed. I also liked that even though it is part of a continuing series, this book still has a satisfying ending of its own. Everything. I really liked the voices he created for all the children -- they were each identifiable, and it was clear who was speaking. All the adults had their own personality as well. The manticore creature's voice was especially fun. His storytelling narrative had a great pace and emotion to it, and drew me into the story. This was a fun book that I think kids and families with kids can enjoy. The story is very engaging and holds the attention to the end. If you are fans of fantasy (shape-shifters, mythical creatures, etc.) you should give it a shot, and though it is geared toward kids, I enjoyed it as an adult. I will listen to this again with my kids (5- and 6-years old) on our next road trip. I listened to the Audible audio version of this book, and the narrator takes some getting used to. He does really well at giving each character a unique voice, but I had a hard time listening to the lisping "Emily" character, and the narrator does have a "unique" cadence when doing the "narrator" voice, which I was really distracted by in the first book I listened to by him, but have since gotten mostly used to. Overall, a fun, clean book that can be enjoyed together as a family. 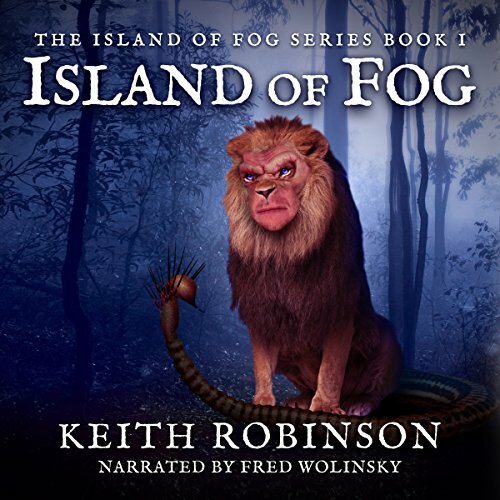 Where does Island of Fog, Book 1 rank among all the audiobooks you’ve listened to so far? Among this genre wow right up there, it was great. This is hard to answer without spoilers but I would have to say when the dragon first appeared. Have you listened to any of Fred Wolinsky’s other performances before? How does this one compare? No this was a first but I will be sure to look for more by Mr. Wolinsky. Yes, but not laugh or cry more of mouth open like a fly catcher type reaction. Wowed, might be the word. This is a great audible do not pass this up is awesome. What does Fred Wolinsky bring to the story that you wouldn’t experience if you just read the book? The number of distinct voices Mr. Wolinsky is able to pull off is astonishing. That is talent. I found that the audio book took a lot longer to listen to than it would have taken me to read (I am a pretty fast reader). I think I like that though. It forced me to slow down and kind of added more suspense to the story for me. Plus it became a family activity. Once I started listening to it, my parents and sister would sit down next to me as it was playing. What I Thought- This was a great story. Mr. Robinson creates realistic characters (well, besides the whole changing-into-monsters thing) with distinct personalities that make sense. There are a lot of characters in the story, but each serve a purpose and none felt like they were “filler.” THe story is told from the perspective of Hal, one of the children. I like this point of view because the reader gets to discover the island’s secrets along with Hal. The book is kind of post-apocalyptic, as in a virus killed off most the population in the world, and drove the rest insane. Strangely enough, it is all believable. Even the part about another dimension-thingy. The setting adds to the mystery of the story and I like how bits of the plot are revealed slowly at first and then the last part of the book is jammed packed excitement. Mr. Robinson explains things well, and keeps you hooked. Now, onto Mr. Wolinsky’s performance. If I didn’t know that this was one person, I might have believed that it was (at least) two people. The number of distinct voices Mr. Wolinsky is able to pull off is astonishing. That is talent. I found that the audio book took a lot longer to listen to than it would have taken me to read (I am a pretty fast reader). I think I like that though. It forced me to slow down and kind of added more suspense to the story for me. Plus it became a family activity. Once I started listening to it, my parents and sister would sit down next to me as it was playing. We don’t listen to many audio-books, but maybe we will now. An all-around great audio-book! The genre for ISLAND OF FOG is actually difficult to pin down. There are components of several different genres which listeners would at first think incompatible. Yet somehow author, Keith Robinson is able to connect these seemingly disparate genres and to combine them into a wonderfully written tale. I believe it is targeted at Middle Grade listeners, but Young Adult and Adult listeners will enjoy it as well. I enjoyed ISLAND OF FOG's unique mix of characters. On an island off the coast of the United States are a small group of self-sufficient families. Each family has one child; a boy or girl twelve years old. The island is covered with a fog that never lifts. In fact, none of the children living on the island have ever seen the sun. One by one each of the children start to experience weird bodily changes. These changes are definitely not the normal changes that you might expect twelve year olds to be faced with at the onset of puberty. Something very strange is happening to them. I do not want to give away too much of the plot, so I won't tell you what the changes are. This audiobook will grab and hold your attention and the narrator is able to voice the many characters so that each one has it's own distinct sound. This is actually quite a feat considering the number of characters. This book is family friendly, but still contains enough suspense and adventure to grab and hold the listener's attention. Since it is summertime now and many families are heading off on driving vacations, I would highly recommend listening to this audiobook with your kids in the car. It is the type of book that kids from the age of eight and up will enjoy. It also has enough plot twists and science to keep the adults interested as well. Now is the perfect time to buy this audiobook. ISLAND OF FOG is the first book in what promises to be an entertaining middle-grade fantasy series. Ruined world + mythological beasts = epic fun! Set in a future post-apocalyptic world, 8 families live in quiet solitude on a foggy island, safe from whatever wrecked humanity. The kids are all 12 years old or close to it. While they have each been long curious about the mainland, they also knew there was no way to go exploring. Yet now things are happening to them and secrets long kept are becoming clear. The kids are changing but they don’t know why, or what they will become, or how their parents will react. These 8 kids, Hal, Robbie, Abigail, Darcy, Dewey, Emily, Fenton, and Lauren, have grown up on this island with their parents, some hogs, cows, a dog, & a cat. There’s no electricity, no indoor plumbing, and no majestic views. The island is perpetually foggy. The kids have never seen a clear night with twinkling stars. The author does a pretty good job setting the stage and giving the reader the feel of the place. The foggy island has shaped these kids as much as their schooling or their parents’ house rules. I really liked the foggy atmosphere because it gave the whole book a mysterious quality. The families have worked out a communal way to live on the island. One woman is the school teacher, another one the doctor, and yet another bakes weekly bread for all the households. Most of the men work the communal farm. I was surprised that the kids never had farm chores. In fact, they seem to have very few responsibilities other than homework and keeping their rooms clean. I would have liked to see the kids a little more involved in the day to day chores as such a little community probably couldn’t let the kids off to play so often. But that is a tiny quibble compared to how much enjoyment I got out of this book. So these kids are in for an adventure and things start off a bit slowly. We learn about them, the island, and a few hints as to why they are on the island. Then things pick up with Abigail, who is the first to change and she shares this info with a chosen few. Each kid has a different reaction to these changes and I really liked this aspect. After all, they are all different people. Meanwhile, there are these sad little remembrances of a family that lost their son many years ago and the couple left the island. Well, Hal & Robbie went adventuring on the island and they ran into something completely unexpected. It was Thomas, the long lost boy, but he’s a manticore. I have no qualms telling you this since he is on the cover art. Thomas is not a well-adjusted kid and doesn’t play well with others, so Hal & Robbie have to flee. To me, Thomas is a rather interesting side character and we learn more about him later in the book. He changed years earlier than the other kids and has been managing on his own for years in the depths of the woods. Once the adults become aware that at least one of the kids is changing, a specialist, Miss Simone, is called in. This is the first person from off the island the kids have met. They obviously have lots of questions. Yet Simone is evasive and prying at the same time. The kids don’t trust her. They take it upon themselves to do some actions that inadvertently endanger some of the islands inhabitants. The story lagged in places for me. I felt certain arguments were repeated and repeated. Also, I felt the kids were rather slow to get to the boiling point. After all, their parents kept the biggest secret of their young lives from them, plus all the secrecy about the world off the island. Then this stranger, Miss Simone, comes and wants them to divulge all their secrets and she wants to irrevocably change their lives, all without telling them anything. So I kept waiting for one of the kids to explode in anger, or at least, in indignation. It was really slow in coming and then was a pretty mild rebuke. That aspect watered down the kids’ characters for me. The last quarter of the book had the most action and was the most well written. Things are moving along and the kids’ personalities are well-fleshed out. Also, we see more of the adults who were largely these shadowy characters in the background up to this point. Plus Miss Simone gets some depth to her mysterious character. It was a pretty good read and I want to know what happens next to these kids. I received this book free of charge from the narrator in exchange for an honest review. The Narration: I have listened to several books narrated by Fred Wolinsky and this may be the best performance yet. Each kid was distinct and sounded like a kid. He also had really good female voices, which I appreciated as I haven’t always liked his female voices. As always, he is great at imbuing the characters with emotions and by the end of the book, there were plenty of emotions to be had!